Subtle notes of Japanese matcha tea sing in a soft, moist cake donut. Grist & Toll. (It’s a very unique flour mill located in LA.) I attribute the perfect balance of soft, moist and subtle matcha to the premium products. 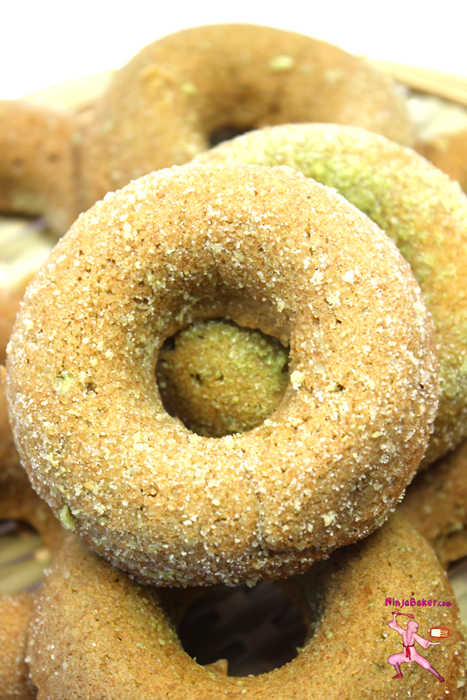 The donut recipe is adapted from King Arthur Flour. The topping is adapted from Food 52. Lightly grease the wells of three standard-size donut pans with coconut oil. smooth. One at a time, add the eggs. Stir in the matcha, baking powder, baking soda, salt, and vanilla. Starting and ending with the flour, alternate mixing in the flour with the coconut creamer. Bake for 10 minutes (rotating the pan at the halfway point.) The matcha donuts are ready when a toothpick inserted in the center comes out clean. Remove from the pans after 5 to 7 minutes. Sprinkle with matcha sugar powder. In a food processor, pulse all the ingredients together until combined.